This past Wednesday, we had friends over for dinner — a sweet couple and their two-year-old girl. The best part of having dinner friends is that we get to have real dinner conversation with real, breathing, adults who actually talk about something BESIDES Star Wars. However, in order for this clever conversing to occur, we needed something with which to distract the kids. A Secret Weapon, if you will. Like a big ol’ box of crayons!!!! YES! It’s only during Dinner Guest Time that the kids are allowed to get out the crayons. They don’t actually color with the crayons — that would be work — but they get to spread them out all over the (freshly cleaned) couch, lob them at each other, build little crayon forts, chew on them, stick them up their noses. And so it was — the kids were merrily tossing and rolling crayons around the house like so many Mardi Gras beads, and the grownups were nibbling on Coconut Cream Cheese Flan (awesome) and discussing politics. Admittedly, the discussion did involve the word “Obamarama,” but it was immediately followed up with a bit about health care reform, and I figure the two cancel each other out. However, all of this came to a crashing halt when we discovered that the kids had — somehow — managed to unearth the box of markers as well. You know how we found out? Yes, that’s Eleanor. 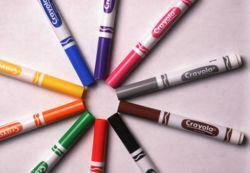 For some reason, when our kids are presented with markers, they always prefer to color themselves instead of paper. Usually the face, but they’ll do the tummy if there’s tummy access. (Ella was zipped into her footie pajamas at the time, so the tummy remained, thankfully, unscathed.) Eleanor frequently likes to turn herself into a 13th-century Scottish warrior. 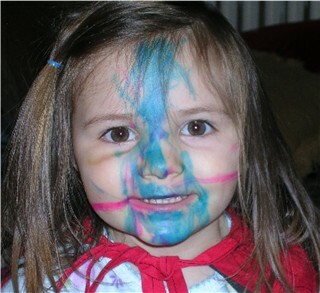 Oh, how she howled when we pried the blue marker out of her chubby little hand! We’ve scrubbed and scrubbed her little face daily since then, but the so-called “Washable” marker stains are still showing faintly on her nose. A blue nose. Like she’s from Nova Scotia or something. I Ain’t Gonna Paint No More by Karen Beaumont, illus. David Catrow. Completely addictive rhythmic text, rainbow-bright illustrations. This book pushes the Silly-O-Meter way, way up, and is excellent for teaching pre-literacy skills. A modern must-read for the preschool set.